class="page-template page-template-page-sections page-template-page-sections-php page page-id-937 samba_theme wpb-js-composer js-comp-ver-4.1 vc_responsive"
Your conservatory should be a place of relaxation, whatever the weather – although normally thought of as a place to enjoy the lighter nights and better weather, well ventilated and comfortable, a conservatory fulfils many roles. Office, playroom or even sometimes even as an extra bedroom in the event of unannounced guests, the conservatory (or even orangery) is the place where everybody likes to be, and is often an expensive, though welcome addition to the structure of your home. Whatever its purpose, we at QCF Bournemouth have a flooring solution that will be perfect for you. Whether you choose hard flooring, vinyl or carpet, let us share our expertise, gained through over 40 years in the flooring business to guide and inspire you, making your conservatory truly part of your home. 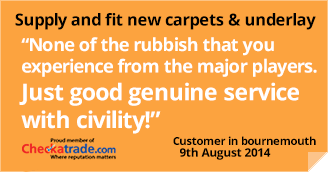 Whichever solution you choose, you can be sure it will be expertly fitted and with a 100% feedback score on the independent Checkatrade service, you can be confident in your choice.